What you put into your mouth and body, directly affects your physical appearance. If you are predominantly fast food and junk eater, you are bound to put on weight and your skin will probably reflect the amount of grease and saturated fats you have been consuming. The key to looking well is eating well. Coconut oil: is made up of medium chain fatty acids, and is a great source of energy as well as fat loss. A teaspoon will quell the sugar cravings right away, and it’s also fab for cooking! Coconut oil is known to help reduce scaring, stretch marks and prevent sagging skin. It’s a natural “miracle” cream! Studies have shown that coconut oil’s fatty acids are actually 15 times better at this than benzoyl peroxide. Fish: Salmon, herring, mackerel, sardines, anchovies, and rainbow trout all contain omega–3 fats, which help fortify skin cell membranes, protect against sun damage, and may also reduce the risk of certain forms of skin cancer. Having salmon on hand is the best way to ensure you'll keep up your skin's nutritious regimen. Frozen Organic Vegetables: frozen veg are snap frozen, retaining nutrition. Scientists from Leatherhead Food Research and University of Chester, carried out 40 tests to measure nutrient levels in produce that had been sitting in a fridge for three days, compared to frozen equivalents. They found more beneficial nutrients overall in the frozen samples, in everything from broccoli to blueberries. Frozen vegetables contain powerful antioxidants that help to protect skin from the cellular damage caused by free radicals. Free radicals can cause wrinkling and age spots. Eat a rainbow of colourful vegetables and aim for at least three-five portions a day. Betacarotene, found in pumpkin, carrots and sweet potatoes, and lutein, found in kale and spinach are potent antioxidants, important for normal skin cell development and healthy skin tone. Greek organic yoghurt: Greek yoghurt is healthy as it is high in probiotics; good bacteria. The live microorganisms in Greek yogurt can help improve your digestive system, help your body absorb nutrients and improve your immune health. Greek yogurt may also help ease gastrointestinal conditions like constipation, inflammatory bowel disease, lactose intolerance and diarrhea. 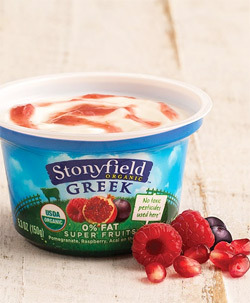 For best results, consume at least one serving of probiotic-rich foods like Greek yogurt every day. Dark chocolate: Flavonols, the antioxidants found in dark chocolate, reduce roughness in the skin and provide sun protection. In a study (the Journal of Nutrition) women who drank cocoa fortified with a chocolate bar's worth of flavonols had better skin texture and stronger resistance to UV rays than those who drank significantly few flavonols. Red wine: There is a much higher concentration of antioxidants called polyphenols, including resveratrol, in wine compared to grape juice. In wine, the skin and seeds are part of the fermenting process, which are absent in grape juice. Resveratrol, found in grape skins and seeds, increases HDL cholesterol and prevent blood clotting. Flavonoids (polyphenols), on the other hand, exhibit antioxidant properties helping prevent blood clots and plaques formation in arteries. 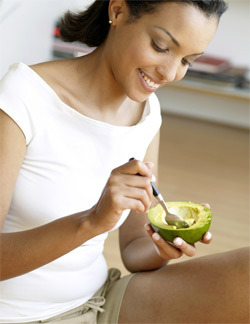 Avocado: It is rich in healthy fatty acids, vitamins and antioxidants that can improve your skin from the inside. Avocado contains good amounts of vitamin C for healthy skin. We should ideally have many sources of vitamin C in our diet every day as it is water soluble and cannot be stored in your body. 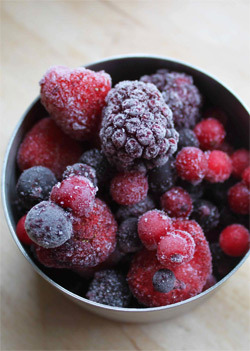 Frozen berries: add them to the yoghurt or your protein shake. After freezing blueberries at temperatures of 0°F (-17°C) or lower for periods of time between 3-6 months, researchers have discovered no significant lowering of overall antioxidant capacity or anthocyanin concentrations. Blueberries are beneficial to the whole body. There is new evidence that damage to muscles following overly taxing exercise can be reduced through consumption of blueberries. There is also evidence that protection of the nervous system from oxidative stress can be accomplished by regular consumption of blueberries. Nuts and seeds: Avoid peanuts as they are legumes not nuts. Slow down the development of saggy, wrinkled skin by spooning sunflower seeds and flax seeds over salad or yogurt. These seeds are replete with vitamin E -- a powerful antioxidant that decelerates the aging of skin cells, keeping us looking younger longer. Almonds are stuffed with vitamin E, which helps defend against sun damage. Water: It's not a "food," I se, but water is crucial when it comes to skin health because it flushes toxins out of your body, delivers nutrients to your cells, and keeps your organs functioning. It also helps keep your cells plump and full, which makes your skin look firmer and clearer. Keep these foods ready and enjoy without worrying about what to eat on those days when you just can’t be bothered! Probiotics: Can they Provide Better Bowel Movement? Anti-wrinkle creams: do they work?